According to indeed.com, the average salary of a certified nursing assistant in Iowa was $24,000 (as of December 2014). The number of CNAs employed in IA in May 2013 was 23,680, as per the data of the Bureau of Labor Statistics. The mean annual and hourly wages were $25,310 and $12.17, respectively. Employment per 1000 jobs was 15.88. The average salary of a CNA for the job postings was 2% lower than the average CNA wages all over the country. 90% of CNAs made less than $33,630; 10% made more than $33,630. 75% of certified nurse assistants offered less than $28,310; the remaining 25% offered more than $28,310. 25% were waged less than $21,310; 75% were waged more than $21,310. 10% of CNAs were paid less than $19,770; 90% were offered more than $19,770. One of the important factors that affect the salary of a CNA is the geographical location. In Iowa, the cities with the maximum median annual salary ($29,430) were Ankeny, Des Moines, Urbandale, and West Des Moines. According to salary.com, the lowest paying city was Ames, with median annual salary of $24,936 and median monthly salary of $2,078. The median weekly wages in the state ranged from $480 to $566, and median hourly salary fluctuates from $12 to $14. As per the statistics provided by the BLS, the job opportunities for nursing assistants are expected to grow by 21 percent in the forthcoming years. Therefore, CNA applicants will be able to avail a total of 312,200 new job positions by 2022. This expected growth is comparatively higher than all other occupations in USA. It has been predicted that the home health services and community rehabilitation services will provide the best job opportunities to the nurse aides. Question 1 – I will start working as a CNA in a couple of months. Can anyone tell me some of the best paid job titles? Answer – In Iowa, CNA Hospice, CNA Rrmc, Medical Assistant Family Practice, CNA Medical Surgical are a few job titles that earned maximum annual wages. Question 2 – How much money does a certified nurse aide make in Iowa? 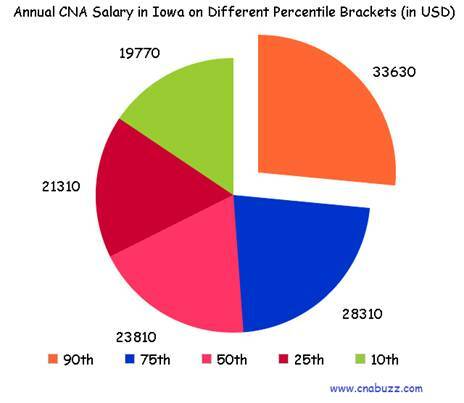 Answer – According to indeed.com, the average salary of a CNA in the state of IA is $24,000 (as of December 2014).